One of my greatest desire is to own a successful online business that cuts across the globe just like facebook, alibaba, e-bay, payoneer, google, etc. I overheard an uncle of mine discussing with some young folks how he travelled to a nearby African country just to set up a business back in the 90’s. But it was so unfortunate that it couldn’t work out for him then even though he has his business over Africa right now. You too can do it, yes you can! Just like Martin Luther King Jr said. The internet has so much made it easy for you to set up a large business that cuts across the continent of Africa and the world at large within days if not even hours. You don’t need to be an Aliko Dangote or a Strive Masiyiwa to do that. Just with your smart phone with an internet connection you can build a multinational business that goes beyond the continent of Africa and the world at large. In the present day Africa there are over 249 million smart phone users that you can connect with and push your business to the heights. What you need do is solve their problems by rendering services or products they need. Just recently, Kwese TV owned by Strive Masiyiwa launched Kwese APP that allows users watch TV on their mobile phones from any part of Africa. They have even started selling their decoders and dish online (e-commerce) and you can register as a dealer. Now, let me remind you that it doesn’t matter what kind of business you are doing, you can grow it, nurture it, expand it all over the world just with the internet. That’s the secret behind Google’s success, that’s the secret behind Alibaba’s expansion, that’s why Netflix keeps growing. Just like one of my mentors would say: “I am sure your e-maginations are working overtime”. You need I remind you that the internet today is like a landed property where you can build anything on? Yes! You can build your office, business, homes, online shopping malls, and retails stores. To those my friends and readers on facebook what have you built on the internet? Is it just to post selfies and updates on facebook? It’s time to change! I sat down just recently asking myself what business I can invest in and behold something struck me; saying what business can you run effectively besides a virtual business? Yes all I feel and breathe is a business on the internet because it is easy to run and stress free. Just with your smart phone or laptop you can do exceedingly great things. One thing is sure, E-commerce is taking over Africa and its high time we Africans (especially the youths) tap into it. Say to yourself you would not be left out. These are some questions you should ask yourself right now: how can I move my business to the internet? 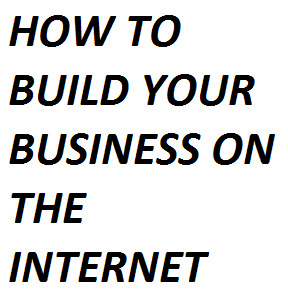 - How can I build and grow my business on the platform the internet provides? - How can I create an innovative idea for my business through the internet? You can check my blog or subsequent articles on internet business.